What covers up to 600,000 square kilometers (230,000 square miles) of Earth’s surface, provides benefits worth an estimated US$570 billion or more each year, and is rapidly being lost due to human activity? And they’re hoping that will change: The World Seagrass Association has released a statement urging the world’s conservation leaders to protect seagrass meadows from human harm through policies, education and action. Seagrasses are flowering plants that evolved from land-based counterparts millions of years ago. Vast swaths stretch along coastlines around the world, sheltering countless forms of marine life, from manatees and turtles to seahorses, shrimp and fish. And they provide a spectrum of services to humans, including sequestering millions of metric tons of carbon each year, protecting shorelines, providing nurseries for marine life, contributing to global food security, supporting biodiversity and keeping ocean water clean. But at the same time, humans are impairing their ability to do so through a perfect storm of onslaughts: runoff from cities, factories and farms; port construction and dredging; and food production activities such as trawling and aquaculture. All told, the Ocean Health Index estimates the planet has lost more than one-quarter of all seagrass meadows since 1900. 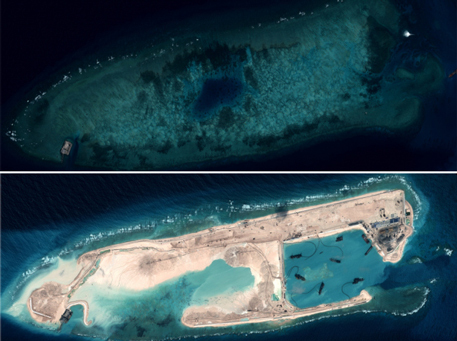 And as human population booms and coastlines develop, the destruction is accelerating — with particularly heavy losses being documented in such diverse settings as Singapore, Canada, the Caribbean and the British Isles. Project ROI, an initiative created in partnership with billion-dollar corporations Verizon and Campbell, the research firm IO Sustainability, and Babson College, drew from hundreds of research studies to quantify the benefits of strong sustainability programs. When done right, the project concluded, sustainable initiatives can increase sale revenue by up to 20 percent, increase market value by nearly 10 percent, lead to lower investment risk and cut employee turnover rates in half. Sustainability can boost profits through the little actions employees take on a routine basis. Research shows that WeSpire Sustainability, an online employee engagement project based on behavioral science, has helped MGM Resorts save about US$5 million annually by engaging nearly a third of its employees (19,500 people) in a social media platform that guides green actions related to waste, water, fuel, emissions and energy. The site offers tips such as taking the stairs, unplugging your cellphone after it’s fully charged and using energy-efficient office equipment. Participants rack up points, compare their progress to other co-workers, exchange ideas and learn about the impacts that these small actions have on the environment. The program suggests that companies can save millions by integrating sustainable practices across departments, committing to meet environmental regulations and targets, and boosting the energy efficiency of everyday workplace functions. As globalization strengthens communication across the world, relationships with local communities are more important than ever for multinational corporations to achieve success, according to business, international relations and public policy scholar Witold Henisz. His book, Corporate Diplomacy: Building Reputations and Relationships with External Stakeholders, describes studies documenting the trials and failures of multinational companies that alienated themselves from local realities and concerns. More importantly, Henisz presents solutions that real companies have found to develop trust, collaboration and respectful communication among communities with differing social, political and cultural perspectives or histories of colonization, for example. Instead of perceiving external stakeholders as “external,” he argues, entities such as government officials, locally employed workers, legislators and NGOs should be an integrated part of decision-making. In the long term, developing a partnership with local populations leads not only to positive, long-term profits for business but also to work that more closely aligns with global sustainability goals. Wind energy is soaring around the world, thanks to technology advances and energy policies that have reduced its cost. And things are only going to get better — with prices dropping substantially by mid-century, according to a survey of 163 of the world’s leading wind energy experts. The results, published in the journal Nature Energy, suggest that the cost of electricity from wind could drop by 24–30 percent by 2030 relative to 2014 prices, and by 35–41 percent by 2050. The researchers asked experts about three wind power applications: onshore wind, fixed-bottom offshore wind and floating offshore wind. The results indicate that onshore wind should remain cheaper than offshore. But the actual cost of offshore wind will drop more by 2050 than onshore, which makes sense since offshore wind is a relatively immature technology, hence there’s more room for improvements. The reasons for dropping prices varied by type of wind installation. For all types, one key factor was larger turbines with wider rotors, which increase the amount of energy a project actually generates. Another common reason was lower upfront capital costs and, for offshore wind, lower financing cost. Agroforestry — integrating trees into cropland or pastureland — is often discussed as a promising strategy for helping to ease the threat of climate change because trees are particularly good at sucking carbon dioxide from the air and socking it away for the long term. However, most global and regional calculations of carbon capture and storage, including those of the Intergovernmental Panel on Climate Change, ignore farm forests. That could change, thanks to a new study published in Scientific Reports that takes a look at trees on agricultural land and quantifies the powerful role they play in sequestering carbon. Using estimates of global farmland tree cover derived from remote sensing observations, a team of researchers from Asia, Africa and Europe calculated the amount of carbon captured and stored by trees growing on farmland. When carbon stored by these trees was included, total carbon storage for agricultural land measured more than four times higher than current IPCC default values. “These results show that existing tree cover — thus far ignored in most global and regional calculations — makes a major contribution to the carbon pool on agricultural lands,” the researchers wrote. The study found that as the world’s forest resources decline, tree cover on agricultural land is expanding. Analysis of the remote sensing results revealed that 43 percent of the world’s agricultural land was forested in 2010, a 2 percent increase over the previous 10 years. Looking at regional patterns in the distribution of agricultural tree cover, the researchers found high percentages of tree cover occurring in humid regions such as Southeast Asia, Central America, eastern South America and central and coastal Africa. Tree cover was moderate in the majority of agricultural areas in South Asia, sub-humid Africa, Central and Western Europe, Amazonian South America and Midwestern North America. Agricultural areas with low tree cover included Southwest Australia, Eastern China, the northern prairies of North America, and the southern border of the Sahara. Heavily populated areas tended to have less tree cover, despite their climate, so regional variations and trends were also investigated. This analysis revealed many areas where higher tree cover density and carbon storage are possible. Encouraging agroforestry in these regions through policy and incentives, the researchers noted, could be an “achievable and relatively fast” path to increasing greenhouse gas absorption. The researchers also examined the amount of carbon stored on agricultural land in individual countries and found insightful differences. Places where forests are regarded as nationally important, for example Brazil or Indonesia, have high and increasing carbon storage levels on agricultural land. In Brazil, some of the increase may stem from policy initiatives and the adoption of agroforestry practices. Argentina, on the other hand, has experienced substantial loss of carbon capture and storage, most likely due to widespread adoption of large scale mechanized soy cultivation over the past decade. The report notes that more research is necessary to understand what is driving these trends so effective policies and market incentives can be developed to both reduce forest conversion and encourage more trees on farmland. In addition to being an efficient strategy to offset carbon losses due to deforestation, the researchers noted that integrating trees into the agricultural landscape also benefits small farmers around the globe by helping to optimize soil moisture, boosting soil nitrogen, and in general encouraging a more diverse, productive, profitable, healthy and sustainable use of land. How much raw material does it take to support you? If you’re an average African, about 3 metric tons (3.3 tons) — the equivalent of an elephant’s worth of biomass, fossil fuels, metal ores and nonmetallic minerals — per year. But if you’re an average North American, make that a whopping eight elephants. And those elephants are getting heftier. Even as a growing population puts more pressure on Earth’s resources, we’re becoming less efficient in our use of raw materials — essentially using more than ever to generate a specific amount of economic activity. That’s according to “Global Material Flows and Resource Productivity,” a report released recently by the United Nations Environment Programme that summarizes trends in material use worldwide. The report reveals some startling patterns in the use of materials around the world. Total materials use tripled between 1970 and 2010, from 22 billion metric tons (24 billion tons) to more than 70 billion metric tons (77 billion tons). Even more unsettling, per capita materials use grew from 7 metric tons (7.7 tons) to 10 (11) in 2010. And overall material efficiency — the amount of raw material needed per unit of GDP — has actually decreased worldwide since 2000. In addition to increases in overall consumption, the flow of materials has also shifted. Materials increasingly are being shipped around the world as individual countries become specialized sources of particular resources. Between 1970 and 2010, according to the report, direct trade increased fourfold. If we continue on the current trajectory, the report predicts, we’ll be using nine times as much material in 2050 as we are today — and with that, similarly multiplying the production of environmental-harming by-products such as waste, air and water pollution, and greenhouse gases. Introducing a new indicator, “material footprint of consumption,” the report shows clearly that the entire world can’t consume at the level of the richest among us. It encourages policy-makers and others to work to boost material efficiency and to set into place policies that incorporate social and environmental costs into the price we pay for natural resources. 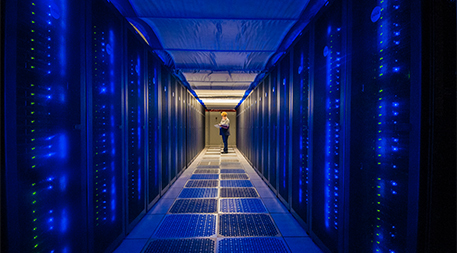 The most valuable tool we have to meet the world’s growing energy demand while reducing greenhouse gas production could be figuring out how to use energy more efficiently. Investing in energy efficiency can also save money, reduce pollution, encourage development and create new jobs. Yet, efficiency is often passed by in favor of more expensive energy solutions. Exactly how much room for improvement there is in this department is the subject of the 2016 International Energy Efficiency Scorecard, published last month by the American Council for an Energy Efficient Economy. To compile the scorecard, researchers examined efficiency policy in 23 of the world’s top energy-consuming countries as well as actual energy-efficiency performance in the three largest energy use categories: buildings, industry and transportation. Germany came in first place with 73.5 out of 100 possible points. Italy and Japan tied for a close second. The United States came in eighth. Saudi Arabia was the lowest-scoring country at 15.5 points. Brazil and South Africa were also at the bottom. “Our results indicate that there are substantial opportunities for improvement in all the economies evaluated in this report,” the authors noted. A closer look reveals numerous policies and practices that are effectively increasing efficiency. Germany’s leadership, for example, is grounded in strong national policies and targets — most notably its National Action Plan on Energy Efficiency, which focuses on reducing energy demand in German buildings, establishing business models for energy efficiency and generating data consumers can use to make decisions regarding their energy use. The country also stood out as a leader in building efficiency, with national energy performance requirements for both new buildings and those undergoing major renovation backed by strong financial support. The reported also called out the United States, for its efficiency-promoting building codes as well as strong appliance and equipment standards. Industry accounts for over half of the world’s total energy demand, and the report applauded Germany, Japan and Italy for encouraging industrial efficiency through a mix of regulatory measures, voluntary actions and financial incentives. Manufacturers in Germany, motivated by tax exemptions and other financial incentives, are voluntarily working to consume less energy and meet greenhouse gas emission reduction targets. Japan and Italy mandate energy efficiency and require large energy consuming companies to appoint energy managers and periodically audit and report on energy use. Germany and Japan have also set goals and provide financial incentives to encourage use of combined heat and power systems, which capture heat normally wasted in conventional power generation for use in industrial processes. In general, most countries did not score as well in transportation as they did in industry, with many countries’ transportation systems reflecting heavier investments in roads than in public transit. The report called out Italy and Japan for practices that include stringent fuel economy requirements for new cars (in Italy’s case, part of a broader European Union initiative) and investments in public transit. When it comes to climate change, a city’s significance stretches past its skyline. Cities, of course, are a source of abundant greenhouse gas emissions from electricity, transportation, construction and more. But that look alone is too narrow, according to Can a City Be Sustainable?, the 2016 installment of the Worldwatch Institute’s State of the World series. In the report Tom Prugh, senior researcher at Worldwatch, contends that a full account of urban greenhouse gas emissions is incomplete without considering two uniquely urban burdens borne beyond municipal boundaries: changes in land use as cities expand and changes in people’s diets as cities grow. Both of those trends spur deforestation, which releases greenhouse gases. Forest loss in the tropics is responsible for about 10 percent of greenhouse gas emissions each year, equivalent to annual emissions from 600 million cars. Many of those emissions are, in effect, exports from the world’s cities. Urban expansion is one cause. As people move in, cities spread out, often into natural areas such as forests. To combat this, the report says, municipalities can try to limit sprawl and promote higher density development (a strategy that comes, however, with its own issues). A thornier threat is dietary change. Moving to a city often means higher wages for workers, who then tend to buy and eat more meat. Growing crops to feed livestock is less efficient than growing crops to feed people, since animals only pass on a fraction of the energy they consume to the humans who consume them. Because farmers get fewer calories per acre when producing meat, richer diets demand more farmland. “Even in relatively highly productive European agriculture, it takes an estimated 0.3 square meters [0.4 square yards] to produce an edible kilogram of vegetables,” Prugh writes in the report, “but 1.2 square meters [1.4 square yards] for a kilogram of milk, 3.5 [4.1] for eggs, 7.3 [8.7] for chicken, 8.9 [10.6] for pork, 10.2 [12.2] for cheese, and 20.9 [24.9] for beef.” Clearing land to produce that food often comes at the cost of more deforestation. Editor’s note: This piece was produced in collaboration with the academic journal Elementa. It is based on “Carrying capacity of U.S. agricultural land: Ten diet scenarios,” published July 22 at Elementa. Vegetarian? Omnivore? Vegan? What should we eat if we want to feed a growing population while minimizing the need to farm more land? We know that meat-based meals require more farmland than plant-based ones. But which diet is the best fit for the mix of croplands and grazing land that supports agriculture today? That’s a different question with a potentially different answer, since much of the land we use to produce our food is better suited for grazing livestock than growing crops. A new study published in Elementa explores this perplexing question of the “foodprint” of different diets. Researchers calculated how much land is needed to feed people under 10 diet scenarios ranging from conventional American to vegan. The study considered land currently farmed throughout the entire continental United States and looked at not only the amount of land needed to support each diet, but also how much of the available land each scenario could use. The 10 scenarios included a diet based on current U.S. food consumption patterns and another that reduced fats and sweeteners to bring the calorie level in line with U.S. Department of Agriculture’s 2010 Dietary Guidelines for Americans. The remaining eight scenarios maintained healthy calorie levels but moved toward increasingly vegetarian eating patterns, including ovo-lacto vegetarian, lacto vegetarian and vegan. The baseline diet — what Americans are eating today — required the most land at 1.08 hectares (2.67 acres, or more than two football fields) per person per year, followed by the reduced-fats-and-sweeteners diet at 1.03 hectares (2.55 acres) per person per year. Land requirements decreased steadily as the proportion of food derived from animals declined, with the three vegetarian diets requiring 0.13 to 0.14 hectares (0.32 to 0.35 acres) per person per year. 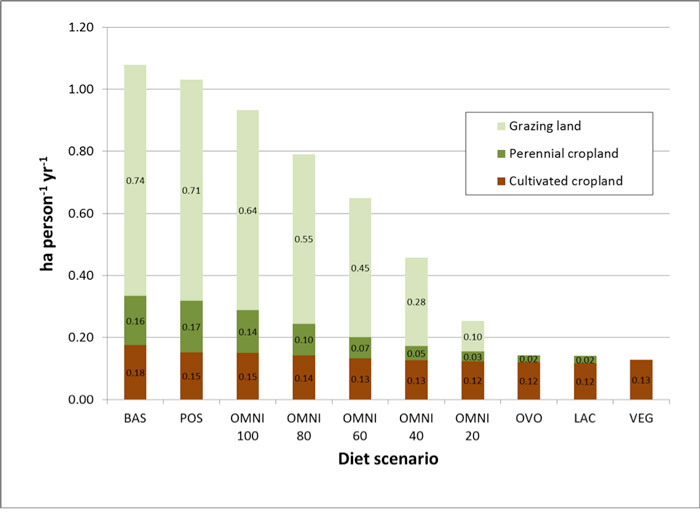 The amount of grazing land, perennial cropland and cultivated cropland needed to support different diets varies widely. Image courtesy of Elementa. Click to expand. Since production of different types of food requires different types of agricultural land, researchers distinguished among three distinct categories of land: grazing land, cultivated cropland and perennial forage cropland. They found that the five diets containing the largest quantities of meat used all of the available cropland and grazing land. 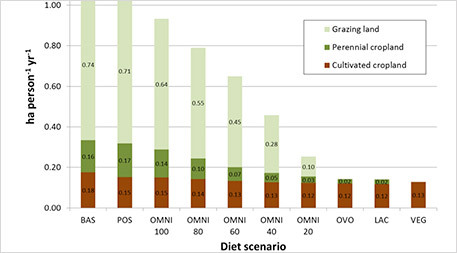 The five diets containing little or no meat still used the maximum available area of cultivated cropland but varied widely in their use of forage and grazing land. The vegan diet relied solely on the land suited to growing crops, using none of the available grazing or forage land. When the number of people who can be fed from the available agricultural land was estimated, results revealed that reducing meat in the diet increases the number of people who could be supported by existing farmland. Estimates of the number of people who could be fed ranged from a 402 million people for the “business as usual” diet to 807 million people in the lacto vegetarian scenario. The vegan diet, surprisingly, fed fewer people than two of the omnivore diets and both of the other vegetarian diets, suggesting food choices that make use of grazing and forage land as well as cropland could feed more people than those that completely eliminate animal-based food from our diets. Inland fish play critical roles in North American ecosystems and economics: In the U.S. alone in 2011, freshwater anglers spent more than $30 billion on their hobby, generating $73 billion in economic output. And fish are important parts of healthy ecosystems, feeding on aquatic plants and animals and in turn providing sustenance to iconic species such as eagles, bears and osprey. It’s no surprise, then, that as climate changes, 30 experts gathered last year in Bozeman, Montana, to explore implications for the well-being of North American fish populations. Reporting earlier this month in a special issue of Fisheries magazine, the researchers summarized a range of actual and anticipated changes in North American inland fish identified by 31 previous studies. The changes relate to shifts not only in temperature but also in other climate-related environmental factors such as salinity, oxygen levels, and size and connectedness of water bodies. Although they noted that it’s difficult to conclusively attribute changes to changing climate due to confounding factors — including other impacts of human activity — the researchers found indications that North American ecosystems are seeing alterations in distribution, timing of spawning, abundance, and growth of fish associated with changing climate. Coldwater species such as trout seem to be particularly affected. Specific changes observed include a northward shift of smallmouth bass in Ontario; slower growth associated with increased temperature in Arctic char and cisco; and faster growth in species such as sockeye salmon and black bass. Some fish species are showing reduced ranges, while for others distribution is increasing. Predator-prey interactions appear to be changing, too, as population redistribution results in new mixes of species within waterways. In addition to reporting on past observations, the scientists also used models to predict that anticipated increases in drought will bring more changes, stressing fish and so increasing mortality. Northern shipping: Is the anticipated climate boost a bust? Editor’s note: This piece was produced in collaboration with the academic journal Elementa. 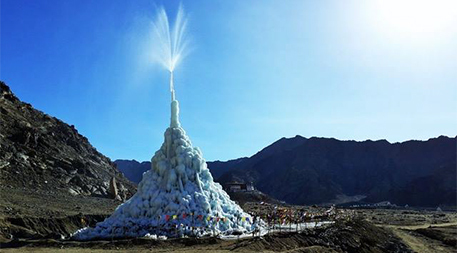 It is based on “Melting Ice, Growing Trade?”, published May 20 at Elementa. Visions of safe passage for cargo ships across the Arctic between Europe and Asia have sprung up in recent years as ice-free zones have appeared along the northern coasts of Russia and Canada. Some shipping companies already have begun taking advantage of the change. But dreamers and schemers may want to think twice about the long-term promise of the so-called Northern Sea Route for boosting trade, caution scientists from the U.K., U.S. and Germany in a study published earlier this month in the journal Elementa. The study, led by Sami Bensassi of the University of Birmingham, brought climate modeling experts and economists together to explore how both sea ice conditions and the economics of shipping are likely to change between 2050 and 2100 as the the planet warms. Researchers began by plotting a likely trade route, then using projections from 33 climate models and two emissions scenarios to predict how long a likely trade route would be open for shipping each year. Finally, they looked at the resulting picture through an economic lens to determine how changes in environmental conditions would likely translate into actual changes in international maritime trade between Europe and Asia. They found that in the second half of this century, climate change is unlikely to dramatically shift cargo ships from their current route through the Suez Canal even if variables such as transit fees, insurance and availability of ports are put aside to focus on uncertainties regarding ice-free dates and distance reduction. Even under the most “aggressive” emissions model and six months’ possible navigation toward the end of the century, the economic models predicted that the NSR would likely boost trade by 7 percent at best between Europe and Asia by the end of the century — the equivalent of an annual growth rate of 0.072 percent. The U.S. Department of Energy just jumped on the podcast train — and what it’s bringing on board just might surprise you. Far from a dry, self-promoting description of government-funded research or admonishment to buy energy-efficient appliances and drive less, the first installment of “Direct Current” offers an informative — and entertaining — dive into an important but little-covered topic: the hidden costs of rooftop solar power. Is biodiversity the best medicine? Forget laughter: Biodiversity could be the best medicine, at least when it comes to keeping plants healthy. Scientists have long been intrigued by how the number of plant species in an area affects plants’ risk of getting slammed by disease. In general, viewpoints boil down to two competing theories. The first, known as amplification, contends that the more plant species there are at a site, the more hosts there will be, and so the more disease there will be as well. 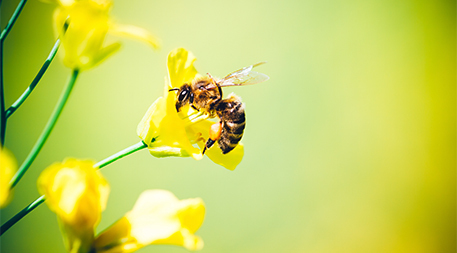 The other, known as dilution, suggests that the more plant species, the less likely it will be that a disease organism can find its particular host, so the impact will be less. Past experiments testing whether diversity offers protection against disease tend to support the dilution theory. However, those experiments have not distinguished well between species richness — the number of different species in an area — and phylogenetic diversity, which also takes into account the relative numbers of plants from the different species. And for the most part they have been performed in highly controlled planting experiments rather than in natural settings. In a study published this month in the journal Ecology, researchers from China and Australia dug deeper into the question by artificially altering plant diversity in an alpine meadow in Tibet in a way that kept the abundance of plants from the various species constant. Measuring the diversity of pathogenic fungi that attack leaves as well as the amount of damage the fungi caused, they found that higher plant species richness was associated with higher fungus diversity but also, interestingly, with less leaf damage. Extending the research, the team also looked at how increasing temperature and nitrogen fertilizer affected the relationship. Both changes, they found, increased the severity of infection in the experimental plots. Editor’s note: This piece is published in collaboration with the academic journal Elementa. It is based on a commentary, “Mobilizing the power of higher education to tackle the grand challenge of sustainability: Lessons from novel initiatives,” published February 23. In a paper published recently in the journal Elementa, leaders from a half-dozen U.S. academic institutions with dedicated sustainability programs shared five recommendations, distilled from their own experiences, for universities seeking to improve their ability to both create tools to advance sustainability and empower individuals and institutions to use them. 1. Focus on solutions. Universities tend to focus on problems rather than solutions. To move the needle on sustainability, the authors call for a new, solutions-focused “social contract” for academia. That may seem like adding more work to already stressed workloads, but in practice, the authors say, the emphasis on solutions has yielded bountiful rewards. Faculty and students alike, they write, “speak of the satisfaction of being part of something larger than themselves, and of using their knowledge to make a difference in the wider world.” And the shift also found support from policy-makers, business leaders and citizen groups. 2. Embrace interdisciplinary collaborations. More than perhaps any other endeavor, advancing sustainability demands collaboration among a wide range of disciplines. That makes universities an ideal setting for this pursuit, since they are by definition multidisciplinary. The challenge, though, is to get experts from different disciplines talking to each other. Strategies for overcoming the institutional roadblocks to interdisciplinary collaboration include engaging faculty who want to make a difference, earmarking funding for work focused on solving problems, being patient with the process and recognizing the critical importance of participation from disciplines outside natural science and engineering. 3. Build partnerships. It’s not easy to build, maintain and use bridges between academia and government, industry and citizens — but to advance sustainability, it’s exceedingly important. External stakeholders have important knowledge and perspectives to share. Partnerships also provide an opportunity to build relationships, mutual understanding and bonhomie that are key to getting things done. The authors point to the Cooperative Extension Service as a valuable model for engaging with stakeholders outside universities. An important part of the equation: Make sure the relationships are two-way. 4. Innovate and persevere. “[R]isk-taking, creative thinking and tenacity are key ingredients in reshaping universities to meet sustainability demands,” the authors write. Particularly important are ownership at the faculty, not just administrative level; strategic use of space and location to cultivate cohesion among disparate parties; integral involvement of students; creation of novel roles (e.g., “professors of practice”) for faculty; and administrative support for boundary crossing. 5. Gather and share lessons learned. Universities are premier research institutions, so what better place to study the dynamics of institutional change? As higher education embraces innovative approaches to addressing sustainability challenges, it would do well to conduct research on what works and doesn’t and share the knowledge gained with others interested in engaging in collaborative problem-solving. The authors note that the common themes are applicable not only to sustainability initiatives, but to other efforts that are part of the growing trend in higher education to not just study and teach, but also become involved in solving societal challenges. Editor’s note: One of the authors on the Elementa paper is affiliated with the University of Minnesota Institute on the Environment, which provides support to Ensia. Worsening wildfires endanger communities. Invasive insects imperil forests. In the American West, many worry about these threats — but fewer fret about climate change, a major force behind both the burning and the bugs. Why? Apparently, because lots of people don’t see the local connection. Polling residents of eastern Oregon, a new study published by University of New Hampshire sociologist Lawrence C. Hamilton and colleagues in the journal Regional Environmental Change found that although regional temperatures there have climbed twice as fast as the global average, only 40 percent of respondents recognized that fact. Echoing previous studies on global warming, local Republicans were more likely to say that temperatures haven’t increased, while Democrats were more likely to acknowledge that they have. In the seven northeastern Oregon counties polled, average summer temperatures have risen over the past century, with heightened warming since the 1970s linked to more frequent wildfires. Compared with an average person, Republicans surveyed were 30 percent less likely to say that summers in their county were growing hotter. Among supporters of the conservative Tea Party movement, this number was even higher. For Democrats, the opposite relationship held. Groups the researchers thought might be more attuned to the rise in temperature — long-term residents, year-round residents and forest landowners — are no more or less likely to know that summers have become warmer. The researchers found that education matters, too, not because it makes people uniformly more informed, but because it intensifies preexisting partisan convictions. Among Democrats and independents in the study, college graduates were more likely than non-graduates to acknowledge local warming. But among Republicans, especially Tea Party supporters, this effect flipped: higher levels of education went hand in hand with a higher probability of saying that Oregon summers haven’t become warmer. Previous work has found this same educational gradient on global warming at a larger scale, and sure enough, when the researchers asked participants about human-induced climate change, the responses fell into the same pattern. Democrats and independents with a college education were more likely than Republican with higher education to acknowledge that humans are changing the climate. The study was based on phone interviews with approximately 1,700 randomly selected residents of northeastern Oregon in 2014. The authors note that although eastern Oregon’s warming trend is statistically significant, the change is small relative to, say, the difference between a warm and cool summer day. That said, survey participants did have the option to say they weren’t sure whether summers were warming or not. Only 10 percent did so, leaving a clear partisan divide in perceptions of local warming. This study presents a new twist on an old tale. Global climate change is, by definition, a worldwide phenomenon bigger than any one place. In contrast, local climate threads through people’s everyday experiences. If we can expect an informed, honest appraisal of climate anywhere, it’s in our own backyards. But if this study rings true on a larger scale, we can’t. Back in 2011, Jennifer Doudna, a biochemist and molecular biologist at the University of California, Berkeley, and Emmanuelle Charpentier, now at the Max Planck Institute for Infection Biology in Germany, grew intrigued by the way bacteria use a molecular system known as CRISPR-Cas9 to respond to viral attacks. For years, bacteria were assumed to be primitive creatures with rudimentary immune systems. But CRISPR-Cas9 revealed a startlingly sophisticated memory-response scheme. The bacteria store DNA samples from invading viruses by tucking them into a DNA library called CRISPR that is part of the bacteria’s natural genome. If the same virus should attack again, the Cas9 enzyme is primed by the CRISPR library to cut (and thus disable) viral DNA with the same sequence. 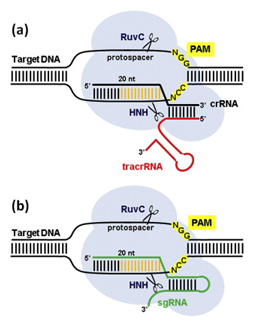 After months of trying to tease apart how the system works, Doudna’s team determined that two RNA molecules play central roles: CRISPR RNA (crRNA), which leads Cas9 to a particular location on the viral gene, and a trans-activating RNA (tracrRNA), which helps activate Cas9. Together, these two RNA molecules empower Cas9 to make its cuts. Still, it was not clear that CRISPR would be all that exciting or useful outside of bacteria. Microbes have very different cell structures than animals and plants, and it was quite possible that the system would only work in bacteria. The real breakthrough occurred in 2012 when Doudna, Charpentier and then-postdoctoral fellow Martin Jinek realized it would be possible to combine the crRNA and the tracrRNA into a single, artificial guide RNA (sgRNA). By adding to the sgRNA a customized “guide segment” matching a particular DNA sequence in an organism of interest, they could aim Cas9 to cut any organism’s genome in any spot they wished. 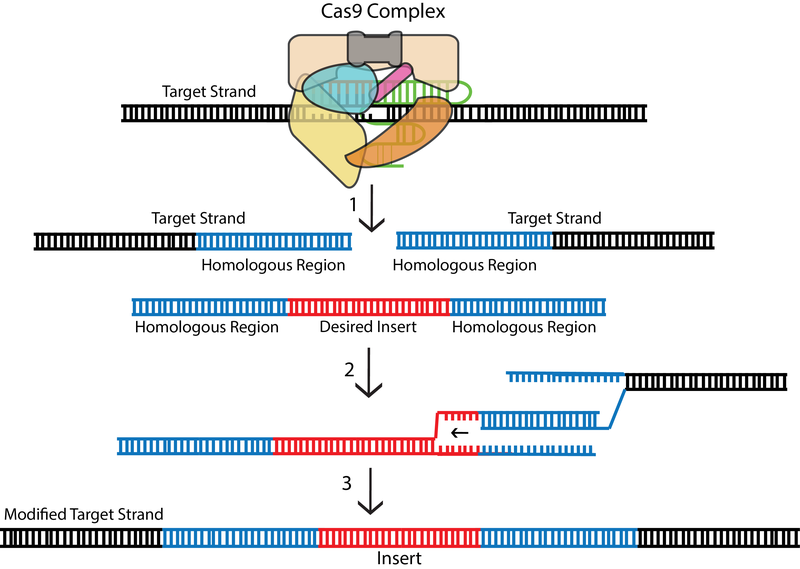 Often likened to a word processor, CRISPR can be used to target whole gene “words” or a few nucleotide “letters” with precision and speed that far outpaces conventional genetic engineering. It’s a superb tool for deleting chunks of DNA and for facilitating precise substitutions when researchers want to swap a few key nucleotide sequences. Less often emphasized is that CRISPR can also be used to add new genes or parts thereof. The key here is understanding what happens after Cas9 makes its cuts. The cell’s DNA repair machinery typically takes over in one of two different modes. In the first mode (called “non-homologous end joining,” or NHEJ), it usually glues the two pieces back together, but imperfectly, deactivating the gene (see “a” above). Such “gene knockouts” don’t involve any foreign DNA but can eliminate traits that affect food quality, confer susceptibility to diseases or divert energy away from valuable end products such as grain or fruit. Occasionally, say researchers, this pathway may leave a DNA cut with “sticky ends,” enabling foreign genes of interest to be directly spliced in (b) — a double-stranded DNA insertion somewhat akin to “old-fashioned” genetic engineering. A second kind of repair (called “homology-directed repair” or “homologous recombination” — HR) is much less common but far more accurate. In HR, the cut ends aren’t just jammed back together; the cell machinery copies a nearby piece of DNA to fix the damaged sequence. By providing a DNA snippet of their choice, scientists can induce the cell to fill in any desired sequence, from a small mutation (c) to a whole new gene (d). This HR pathway, says Fuguo Jiang, a postdoctoral fellow in Doudna’s lab, is not yet fully understood. But, as this illustration shows, it involves a meticulous process of one strand of donor DNA being stitched into the host gene, providing the template for cellular repair. The world has a problem. A phosphorus problem. Needed to fertilize crops, the bulk of phosphorus comes from nonrenewable phosphate rock. While China mines the most — producing almost half the world’s phosphorus — Morocco alone controls three-fourths of global phosphate rock reserves. Year by year those global reserves dwindle, leaving phosphate rock that’s ever lower in quality and ever harder to extract. At the same time, as agriculture expands over the coming decades, experts project increasing demand for mineral phosphorus. Pair declining supply and rising demand with the lopsided geographic distribution of phosphate, and it’s not hard to see why experts think prices are likely to go up, which could threaten global food security. At the same time, excess phosphorus, including that running off feedlots and released from wastewater treatment plants, threatens water quality and ecosystem health as it fertilizes lakes, rivers and ocean waters around the globe. A recent study in Science of the Total Environment examined one solution to these twin problems: recycling. Looking at what recycled phosphorus could do for corn in the United States, the country’s number one crop, the study’s authors found that we’d need just 37 percent of available recyclable domestic phosphorus to fertilize all of the corn in the country. The researchers did the math for animal manure, human waste and wasted food — all of which contain phosphorus that traces back to farmers’ fertilizer — and found that these three sources could furnish more than 1.9 billion kilograms (4.2 billion pounds) of phosphorus each year, with almost 90 percent from manure alone. That’s more than enough to sate American corn’s 724 million kilogram (1.6 billion pound) annual appetite for the element. Spatial analysis showed that we could meet three-fourths of demand with phosphorus recycled in the county of origin. Additional phosphorus would have to travel an average of 302 kilometers (188 miles) to reach farms that need it, meaning that most corn-producing states could fill demand within their borders. Currently only 5 percent of U.S. cropland sees any manure fertilizer at all. While the study’s conclusions are surprising, the authors caution that they don’t intend to propose public policy. Instead, their paper is meant as a “proof of concept” looking at the potential of recycling phosphorus for U.S. corn. Regulatory, logistic and economic concerns remain topics for future work to tackle. For example, the fact that 25 percent of phosphorus for corn would have to come from counties outside that in which the corn is grown underlines the spatial disconnect between phosphorus sources and phosphorus demand in the U.S. According to the researchers, that reality — stemming from the separation of farm animals and crops — has intensified since the 1970s. Potential fixes, the researchers suggest, might involve innovative technologies for better phosphorus recycling, which would let farmers get more phosphorus from other sources nearby, making it less necessary to look beyond county border. A more direct, though perhaps more ambitious, solution might be sociopolitical efforts to bring livestock and cropland closer together again. To come up with the list, team members racked their own brains, monitored social media and consulted more than 400 other individuals to come up with a list of 89 topics that have implications for global conservation and that they rated high in terms of probability of occurring, potential impact and/or likelihood of rapidly emerging. 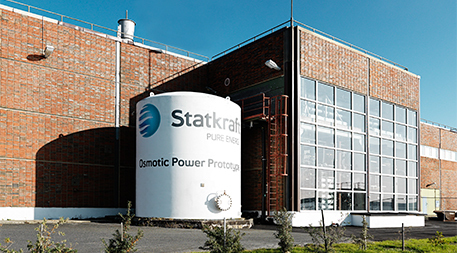 Several years ago Norway experimented with producing electricity using the energy released when salt water mixes with freshwater at the intersection of river and sea. The facility turned out to be too expensive to run, however, so it shut down. With growing interest in renewables and technological advances, however, eyes are turning to this electricity source once again. Implications of implementation for biodiversity include disruption of shoreland habitat for power plant construction and operation as well as potential harm from facility wastewater to species unable to tolerate salt. A major threat to many endangered animals is illegal trade in body parts such as horns and bones. Recent advances in 3-D printing and chemical synthesis have combined to make it possible to make synthetic versions of the desired material. Synthetic rhino horn is already a reality, and other permutations such as synthetic tiger bone and synthetic elephant ivory could be just a Kickstarter campaign away. But would flooding the market with synthetic alternatives reduce demand for the real McCoy, or make genuine parts more sought-after than ever? 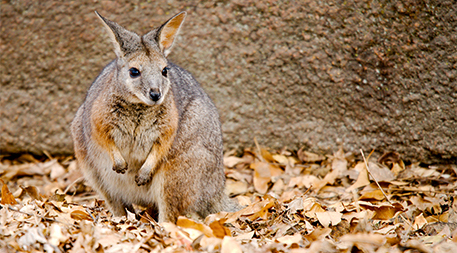 No one knows — but the difference between extinction and survival could hang on the answer. As global population grows, urban population is growing even faster — with 2.5 billion more city dwellers expected by 2050, according to the United Nations. And while urbanization can bring benefits in terms of economies of scale, social cohesion, technological innovation, transportation efficiency and more, cities can also be breeding grounds for poverty, pollution and malaise. In growing cities, the need for infrastructure can quickly outpace our ability to build it. Vancouver, Glasgow, New York and others are tackling this head-on by repurposing and densifying use of existing urban land rather than building out, and by designing buildings in a way that allows them to switch functions — for example, from a theater to a night club — as needs change. Clean, readily available water supplies are a growing concern for growing cities. Efforts to meet future needs include a variety of Internet-based innovations aimed at managing water challenges such as flood control, rainwater management, supply distribution, pipe leakage reduction and sanitation management. Urban trees help reduce temperature extremes, moderate stormwater surges, sequester carbon and capture nutrients from runoff. Melbourne is boosting interest in and appreciation for urban forests by inviting its residents to adopt and name individual trees and share updates, including carbon offset and other information, via social media. People-powered transit not only helps make cities cleaner and less congested, it also can boost human health and well-being. But bicycling can sometimes seem too demanding for a workday commute. To make it more appealing and accessible, innovators are developing products such as the Copenhagen Wheel, a bike that runs partly on a battery recharged by braking and downhill travel. Co-generation facilities boost energy efficiency by taking waste heat from electricity generation and using it to heat or cool buildings. For even more benefit, the carbon dioxide generated in the process can be captured and used for horticulture, manufacturing or other applications. City dwellers around the world are reducing the environmental footprint of consumption through sharing networks. Starting with increasingly common practices such as carpooling, lodging rental and shared ownership, the practice is expanding to include things like co-locating enterprises to allow them to share facilities such as gyms or classrooms. Computer- and smartphone-assisted traffic management and vehicle routing can reduce time and fuel wasted trying to travel through congested areas. Similarly, self-driving vehicles and car sharing can boost efficiency by maximizing use of vehicles and reducing need for space to park idle ones. The Colombian city of Medellin, once considered one of the world’s most dangerous cities, has been transformed by a focus on architecture and design. Shared spaces and improved public transit blur economic boundaries and boost a sense of connection and culture. As cities switch from polluting conventional streetlights to LED-based updates, they have the opportunity to connect light poles to form a web of information sensors that can do everything from gather air quality data to monitor traffic and reduce the risk of crime. Cities can help cut food waste by growing perishable produce right in town, boosting individuals’ connections to food and reducing spoilage-promoting lengthy transit distance and time. With water-based gardening and LED-lighting, walls, roofs and other structures that serve one function can be taught to multitask as a food-producing garden, too. These two words might make you sleepy: stormwater management. But they should make you scared. Or, if a new study can help shake things up, hopeful. Runoff carrying oil, salt, fertilizer, sediment and other pollutants is a top threat to lakes across the U.S., and several factors — including rising population, growing cities and changing climate — are loading the future’s dice in favor of even more trouble. With this challenge in mind, a new study in the Journal of Geophysical Research paves the way to fight flooding and enhance water quality with plans geared toward individual watersheds. In the first multi-factor analysis of land cover and climate for watersheds across the entire continental U.S., researchers from University of Massachusetts Amherst concluded that professionals — think land use experts, city planners and water quality managers — need to remember that myriad factors affect stormwater runoff. Not only that, the factors vary based on space and place: Different watersheds have different temperatures, rainfall, land use, evaporation, plant characteristics, and more. The new paper estimates statistical relationships among these variables for watersheds in all lower 48 states and quantifies relationships in a way that could help decision-makers on the ground make smart choices that allow them to minimize adverse impacts of runoff. With the Paris climate negotiations just two weeks away, we’ll soon see if the world can agree on a plan for slashing greenhouse gas emissions to slow climate change. To get insight into the upcoming conference, a research team from Chalmers University of Technology in Gothenburg, Sweden, built a simplified (read: not completely real-world) mathematical model that reached two conclusions about climate talks: First, the more countries that are involved, the harder it is to settle on a deal. Second — counterintuitively — when negotiators think more strategically, they impede their chance of reaching consensus. To improve on past studies exploring the theory behind negotiation outcomes, the researchers, whose work was reported recently in the journal Nature Climate Change, modeled negotiators with talent for thinking strategically. Under this scenario — which aligns with surveys showing that high-level policy-makers use a degree of strategic reasoning that’s higher than that of the average person — negotiators each want to get the best deal possible for their country: They don’t want to offer any more emission cuts than they have to. Negotiators with high strategic reasoning are marked by a skill for predicting other negotiators’ behavior. Compared with the real thing, this model of climate talks was super simple. That’s because, instead of actual nations and real back-and-forth haggling, the model abstracted to equal-size countries that started with an initial offer of how much they’d cut their greenhouse gas emissions, then gave them a chance to negotiate over a number of turns, either raising or lowering their offers depending on what other countries did. A series of equations shaped how negotiators would react. The team set up several scenarios, some with more strategic negotiators than others. They also varied the number of negotiating countries in each scenario. Groundwater has long been an important resource for irrigation, drinking water, energy production and more, but getting a clear picture of how much is available and being recharged over time has been a challenge. Now an international group of hydrologists led by Tom Gleeson, engineering professor at the University of Victoria, with fellow researchers from the University of Texas at Austin, the University of Calgary and the University of Göttingen, say they’ve produced the first data-driven estimate of Earth’s total supply of groundwater — with a focus on “modern” groundwater. Writing in the journal Nature Geoscience, the researchers estimate the total volume of groundwater in the upper 2 kilometers (1.2 mile) of Earth’s crust to be 22.6 million cubic kilometers (5.4 million cubic miles) — an amount that if extracted and spread evenly across Earth’s land surface would be 180 meters (590 feet) deep. Perhaps most interesting was the study’s focus on “modern” groundwater, or groundwater that is less than 50 years old. Using geochemical, geologic, hydrologic and geospatial data sets, the researchers estimated this newer groundwater accounts for at most 6 percent of all groundwater in Earth’s uppermost layers. This number is important because it represents roughly the amount of groundwater that can recharged in little less than a human lifetime. Furthermore, the study provides an important differentiation between older and more modern groundwater. Older, deeper groundwater is what we typically use for agriculture and industry and may be brackish, saline or low quality, whereas newer, higher quality groundwater closer to the surface is critical to overall aquifer health and recharge, yet may be more susceptible to contamination and climate change. According to Gleeson, this new research differs from GRACE and other technologies previously used to assess global groundwater resources. Whether people have the water they need depends on how much water there is and how much demand there is for it, right? Wrong. According to a recent study published in Environmental Research Letters, governance, not pure supply and demand, is the most prevalent factor determining “water vulnerability” — the degree to which access to water is susceptible to disruption — in low-income nations. Focusing on 119 countries and territories with per capita gross domestic product less than $10,725, researchers from Washington State University and Stanford University identified four basic categories of characteristics important to water supply vulnerability: demand, endowment (a mashup of quantity, quality and variability), infrastructure and institutions (the presence of government regulations and the likelihood they’ll be effective). They then used publicly available data to assess 19 traits representative of those categories, such as access to improved sanitation, dependence on groundwater, virtual water imported and exported, and government corruption. All of the countries were found to be vulnerable in at least one of the four categories, and 23 of them were vulnerable in all four. The category characterizing the highest number of countries — 44 — was that of institutional vulnerability — suggesting that social and political factors are important areas of focus for initiatives aiming to boost water security. Noting that access to water is a fast-growing challenge, with extractive use tripling over the past half century while population doubled, lead author Julie Padowski, a member of the water resources faculty at the University of Washington, suggested in a news release summarizing the paper’s findings that the results could be valuable in helping identify and target strategies for boosting water security. According to a recent report from the U.S. Energy Information Administration, the number of new and reactivated coal mines in the U.S. hit a 10-year low in 2013 — down nearly 67 percent from 2008. Total coal production in the U.S. was also down during the same time period. The drop was driven by a number of factors, including regulatory pressure, reduced investment, shifting demand toward natural gas and renewables and weak exports. Why does this matter? At the end of 2014, the U.S. had 262 billion tons (237 billion metric tons) worth of coal reserves, or about 27 percent of the global total. Following the U.S., the next five countries for coal reserves are Russia, China, Australia, India and Germany. Together these countries account for 77 percent of known global reserves. The decline in domestic coal mining and use may help reduce greenhouse gas emissions as outlined in the EPA’s Clean Power Plan. Human population is expected to soar to between 9 and 10 billion by 2050, with a growing number of people moving into the middle class and requiring more energy, natural resources and animal products. This combination of population growth and resource demand will put increased pressure on the planet’s resources, a fact that has interested parties from academia, nonprofits, government, industry and more scrambling to find ways to improve living conditions for billions of people while staying within the planet’s ecological boundaries. But that’s just the starting point of a recent study led by The Nature Conservancy in partnership with the Department of Geography at McGill University and the University of Minnesota’s Institute on the Environment (which, full disclosure, provides support for Ensia). The researchers analyzed global development drivers, including urbanization, agriculture, energy and mining, to see how future development is likely to affect what’s left of the planet’s remaining natural lands. Their conclusion: 20 percent of all natural lands are at risk from future development. Although the three regions currently with the most developed land — Central America, Europe and South Asia — are projected to remain the most developed, the researchers note that Africa and South America, currently relatively undeveloped, have the greatest amount of land at risk. The researchers estimate that the amount of land developed on those continents in coming decades could be about twice as much as it is today in South America and three times as much in Africa. Meanwhile, only about 5 percent of the lands that face development risk are currently under “strict protection” (many “protected areas” allow some forms of development). The goal of the research wasn’t just to point out where nature is going to be converted to farms, cities and other signs of modern life; it’s meant to offer insights that can be used to balance conservation strategies alongside ongoing development.